Which employer plans are subject to health care reform and related mandates, and which benefits are excepted. Special rules for grandfathered health plans, plus noncompliance consequences. Various plan design and administration reforms, plus fees and other tax rules for both employer plans and insurers. Which employers are subject to the employer shared responsibility penalty (also referred to as the “play or pay” penalty). Understanding “eligible employer-sponsored plans” and the “minimum value” and “affordability” conditions for avoiding the penalty. Penalty for individuals who do not have health insurance (also referred to as the “individual mandate”). How Exchanges and the individual mandate impact employers (including required notices, reporting, and the relationship to employer shared responsibility penalty). 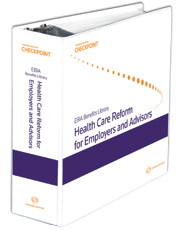 The online edition is updated monthly to keep pace with evolving ACA rules and requirements. V. Which Plans and Insurers Must Comply With the PHSA Mandates?